Preventing child sexual assault is the BIGGEST CHILD PROTECTION CHALLENGE we are facing in Australia today. With 1 in 5 children in Australia sexually harmed each year, it is likely there is a child in your life, or the life of someone you know, who has been a victim of this crime. 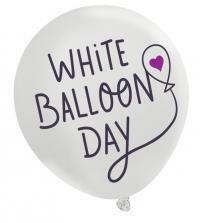 By choosing to support White Balloon Day, you are standing up to perpetrators and recognising that protecting kids is EVERYONE’S BUSINESS.